The Sidewalk chalk does a lot of work all on its own. Last weekend, for example, this one very large strong man on the sidewalk was looking at the scriptures and his head was drooping down. Obviously, something was stirring within him as he was walking past the scriptures. He sat down and I approached him and asked him what was going on. He was very heavy over his family situation. 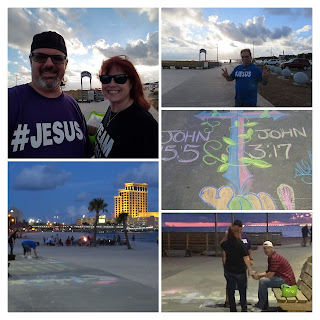 I ministered to him for about 20 to 30 minutes right there by the sidewalk chalk. It was a matter of listening to God, repenting, and putting feet to faith. Two ladies came up to us that we had never met before. They said they led two other people to the Lord that were contemplating the sidewalk chalk scriptures. Other people come up to us and say that when they read the Scriptures it is a word in season for them. Something they needed to hear at that moment. Often times, people will come up to us to talk about what we are doing. We begin to engage with them about the gospel, the kingdom of heaven, and their personal relationship with Jesus Christ. My goal is to activate Kingdom Seekers and get them closer to Jesus then they were before they met me. The awesome thing about the sidewalk chalk Ministry is that we don't even have to be there for it to change lives.